Which Medjet Membership Do You Need? If you live in the United States, Canada or Mexico, Medjet has a membership for you. We cover individuals and families, corporations and non-profits, students, expatriates and more. We protect some of the biggest names in business and entertainment ~ we even protect the NFL when they play their games overseas. We have a membership that can protect you too! Whether you’re traveling for business or pleasure (or both! ), internationally or domestically, short-term or a year abroad, we have a membership for you. 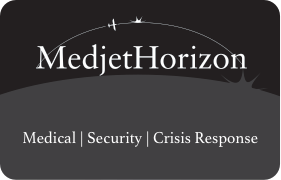 All options are available in MedjetHorizon as well as MedjetAssist. Click on the notes icon beside the membership that interests you to see more (including full Rules and Regulations) for each. 8, 15, 21 or 30 day coverage. Up to Age 75, less than 90 consecutive days abroad. Live and work abroad for 180 or 365 days. Covers both you AND your bike. * Note: MedjetAssist coverage does not exclude motorcycle riding. This membership covers getting your bike transported home as well as you. For US residents living in and traveling within the contiguous 48 states. Click here to explore corporate options. 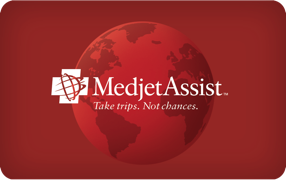 Medjet offers MedjetAssist and MedjetHorizon Short-Term programs for residents of the United States, Canada and Mexico, up to age 75. Travel protection is provided 24 hours a day during the selected travel period. If you’re hospitalized more than 150 miles from home, Medjet will arrange air medical transport to the home hospital of your choice for inpatient care. Add MedjetHorizon security benefits to 8, 15, 21, 30 - Day MedjetAssist Memberships for an additional $ per Individual / $ per Family. No health questions, deductibles or claim forms. No preexisting conditions or adventure travel exclusions. Air medical transport services require that you be hospitalized as an inpatient and need hospitalization upon reaching your destination. No dollar limit on cost of transport. Benefits for short-term membership begin at 12:01 AM morning of effective date and expire 11:59 PM evening of expiration date. Membership must be activated prior to departure from your primary residence. For residents of the U.S., Canada or Mexico, up to age 75, international trips less than 90 consecutive days and unlimited domestic travel coverage (over 150 miles from home). As a MedjetAssist Member, if you become hospitalized 150 miles or more from your primary residence, Medjet will arrange medical transportation to a home-country hospital of your choice for inpatient care. Medjet Collegiate International Membership was developed for students and academic faculty, who are residents of the U.S., Canada or Mexico, up to age 75 and attending, or teaching at, university or other accredited educational programs outside of their home country. Membership is for one full year and allows the member to travel or live outside of his or her home country for up to 20 consecutive weeks per individual trip. A member studying or teaching outside of their home country for an uninterrupted period in excess of 140 consecutive days must enroll in a Medjet Expatriate Membership, available in increments of 180 days and 365 days. For residents of the U.S., Canada or Mexico, age 75-84, who continue to travel and are in good health, Medjet offers the Diamond Membership travel protection program, covering international trips less than 90 consecutive days, and unlimited domestic travel (over 150 miles from home). May not be purchased online. Requires a general health questionnaire and medical statement form be completed by each prospective member and his or her physician. Limited to one medical transport per membership year. The MedjetAssist Domestic Membership provides protection for members up to age 75, residing in and traveling more than 150 miles from their primary residence address within the 48 contiguous United States. In the event of an inpatient hospitalization while traveling 150 miles or more from the member’ primary residence, the Domestic Travel Protection Membership provides for hospital of choice medical transport to a home hospital or specialty hospital within the contiguous 48 United States. For comparison purposes, MedjetAssist annual membership rates are $ and $, respectively and allow for both domestic and international travel protection. You may upgrade anytime to the MedjetAssist annual membership prior to departing on your international trip by simply calling Medjet and paying the membership differential. For residents of the U.S., Canada and Mexico traveling for extended periods in other countries. Membership must be activated prior to departure from your primary US, Canadian or Mexican residence. Medjet’s Motorcycle Membership protection can be added to any existing Medjet membership for an additional fee ($ per motorcycle, per year). For residents of US, Canada, Mexico, active anywhere in the continental U.S., Alaska, Canada and Mexico. The program provides for up to $3,500 USD for the return of the enrolled motorcycle back to the member’s shop or dealership of choice in the member’s home country (coordinated by Medjet). Is hospitalized as an inpatient 150 miles or more from his or her primary residence and is unable to complete the trip. Has sustained physical injuries or illness that were treated on an outpatient basis that prohibit the Member from continued operation of the motorcycle. Has sustained an accident where the Member is not injured but the motorcycle is damaged and not drivable. Doesn’t my current health or travel insurance cover air-medical transports? The vast majority of traditional health providers do not provide coverage for air-medical transport services. If there is some coverage of this type, it will likely contain restrictions and significant out-of-pocket costs. Check with your provider for specific details. How is what Medjet offers different from travel insurance? Medjet is a membership program. Unlike insurance, there are no claim forms, subrogation, or bills that show up months after your incident. You pay your membership fee, and that’s it. No red tape, no paperwork, no cost cap, no fine print. Will Medjet stay in touch with my friends and family while I am being transported? Yes. Medjet will stay in touch with the admitting and receiving hospitals’ medical personnel, and relay necessary information to the member–and his or her family or employer–until the situation is resolved and the member is either able to resume travel or a medical transport is initiated.